A bucket list destination for so many people, Ireland was not on my list. I think I was still holding on to Scotland and how underrated it is. And how so many people want to visit Ireland and don't even consider Scotland. Luke wanted to make a whole week of Ireland, driving all over the whole island (including Northern Ireland), so of course, we made the trip a priority for the year 2015. I sorta wasted my time, but it taught me something. I dedicated an entire week on research where to go, where to stay, what paths to drive, what important sites to see - if we were doing this, we were going to do it right! And then I bought an Ireland travel book. I must have gotten overwhelmed and confused and wanted to make sure I wasn't missing anything. One of the first things in the book is itineraries for several trip lengths. Sure enough, the 7-Day Itinerary was almost identical to what I had planned. It gave me a huge boost of confidence that this whole travel planning job I have taken on is actually something I am good at. But if I had just looked at the book first, it would have saved me a bunch of time. Oh well. Anyway, I quickly learned that we would not be able to drive the entire Irish Isle, and we would also not be able to drive the entire country of Ireland. We would only be able to cover a few parts of the western half of the country. There was just way too much to see and way too little time. It wasn't about ticking a bunch of boxes as fast as we could,. 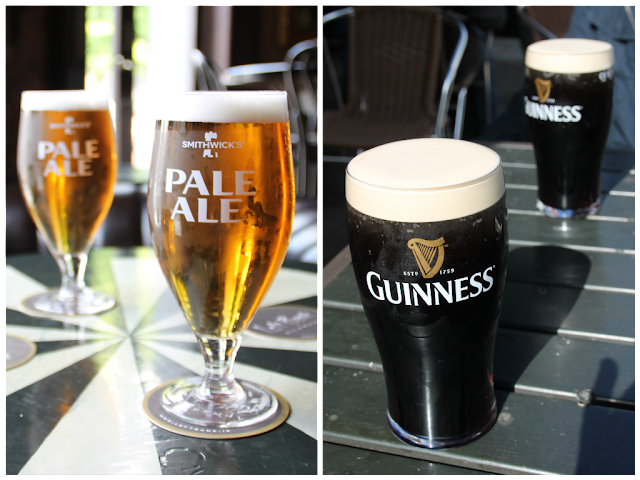 We wanted to actually enjoy Ireland in a relaxing way, and we did. This was probably the luckiest week we will ever come across in our entire lives. We decided to do Ireland in June with hopes of good weather. It would still be cool outside, it would be just barely before high tourist season, hopefully the summer rain wouldn't have hit yet, hopefully we would have some sun, and for sure we wanted to take advantage of the long summer daylight hours. Our wishes came true and only two of our eight days did we have even close to bad weather (which only consisted of clouds and few drops of rain). Luke claims it was due to our awesome timing/planning, but this was ALL luck! We had sun galore and wonderful 60 degree temps - Luke's beautiful bald head got sunburned! We enjoyed plenty of pints while listening to plenty of good music. We had some of the best food in Ireland that we have ever had. I never would have guessed that one! Seafood chowder - soooo sooo good! The driving part was so much better than everyone (aka the internet) made it seem. Compared to Scotland, I think Ireland was a breeze. But we do have hours of practice driving on the wrong side of the road and on the wrong side of the car, so I'm sure that helped. We loved passing by these little guys and asking them to move as they napped in the road. So where did we actually go? As we had already visited Dublin, there was no need to do that again, and because we are lucky to live in London, we had many more airport options than just Dublin. We flew into Shannon Airport on Saturday, and headed straight to Galway City where we stayed for the first three nights. We spent the day on Saturday exploring the city. Saturday was one of our "bad weather" days with high winds and a 5 minute rain shower in the afternoon. On Sunday, we decided to get the main event out of the way first since the sun was supposed to be bright and shining. We drove south along the coast until we reached the Cliffs of Moher. This was when we realized we should have brought sunscreen with us to Ireland! On the way back to Galway City, we drove thru the Burren. Ireland is known for being green but the land was completely opposite, looked like the moon. On Monday, we headed west/northwest to drive around Connemara. We found some of the most secluded spots we have ever been in - Luke wanted to stay forever. On Tuesday, we packed our bags to drive to Kilkenny where we planned to stay for two nights. Along the way we stopped in Limerick to see what it had to offer. We took a driving break halfway thru the week on Wednesday, and spent the entire day exploring Kilkenny. My favorite of this visit was witnessing a random Irish Jig dance at a pub! On Thursday, we packed up again to head back west. We made a few stops along the way to see some castles and abbeys. Just before reaching Dingle Town, where we planned to stay for the last two nights, we drove the Conor Pass across the peninsula which took us along the side of a mountain. Dingle was small and quaint and our apartment was in a bright pink building! Our biggest day of the entire week was Friday when we drove the entire loop of the Ring of Kerry. This was the other "bad weather" day, with clouds and maybe a short light rain shower. We spent about 9 hours in the car - we loved it but were so glad when we got back to Dingle. On our very last day of the trip, we drove the small loop at the edge of the Dingle peninsula, better known as Slea Head Drive. And then we flew out of Kerry Airport that evening. We didn't leave much room for error as far as our days went, but thankfully, our plans went fairly smoothly (obviously the gorgeous weather was the golden ticket). I spent A LOT of time on Google Maps, and A LOT of time of TripAdvisor forums making sure I wasn't over or under packing our days. We still got to sleep in every day (on average, we left around 10:30am each morning) as I knew this would be a necessity for Luke to stay afloat. We still didn't get in everything we wanted, but I am very happy with the final result. I am so glad we took on this adventure - it was worth it! The Republic of Ireland declared independence from Britain in 1919. The majority of the road rules are the same as the UK. The country is part of the Eurozone so its currency is the euro rather than the pound sterling.